Would you like to see a fun upcycle today? Of course you would! I’m almost a bit embarrassed to show you the part of this project that was collected from the side of the road. Although I was able to repurpose it in a cool way. 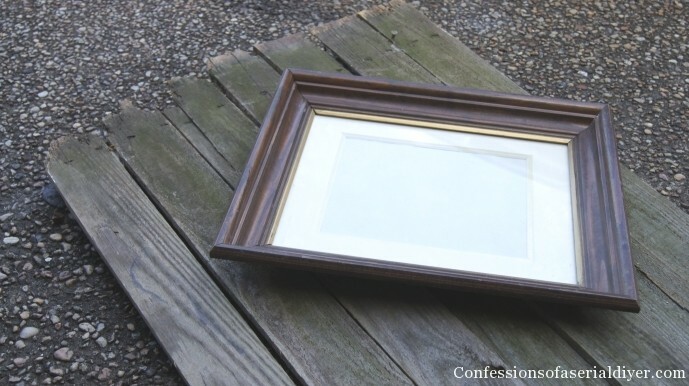 I found the frame at a thrift store for $1. Here is what came out of the frame…circa 1985. Nice. 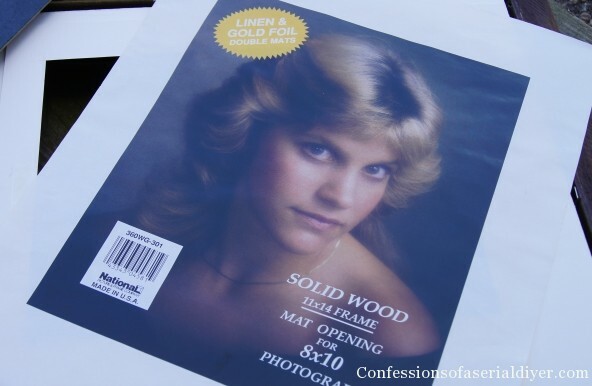 Anyone else remember struggling to get this perfect do? Once I made sure they fit my frame, I gave the pickets a coat of white latex paint and then wiped the paint off with a dry rag to give them a “weathered, but in a pretty way” feel. Very coastal, huh? Then I painted the frame in DIY chalk paint, sanded it just a bit, and followed with a coat of clear wax. 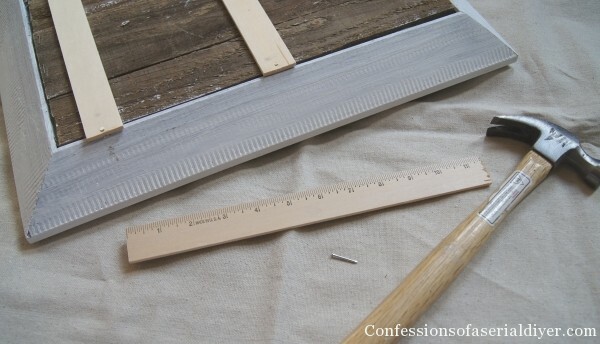 To attach the pickets to the frame, I used wooden rulers I had leftover from an old project. 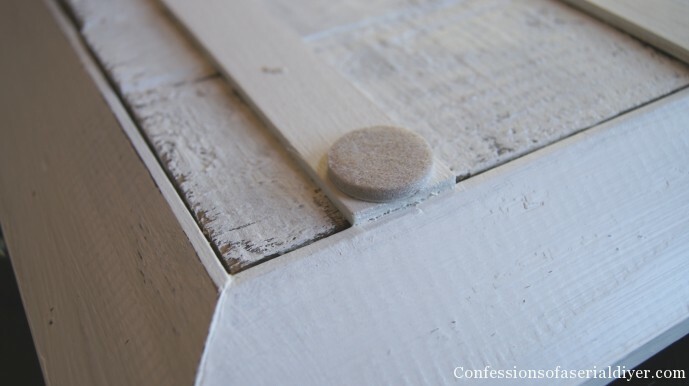 I attached them crosswise with small finishing nails. Then I painted the bottom and added self-adhesive felt discs to prevent the finishing nails from scratching the furniture. Lastly, I added handles to either side. These are screen door handles. The tray cost me a dollar, but the handles were about $5 for the pair, so this was still a great little project for $6! And I came in way under budget for our Get Your DIY on Fall Link Party Challenge Week #3. 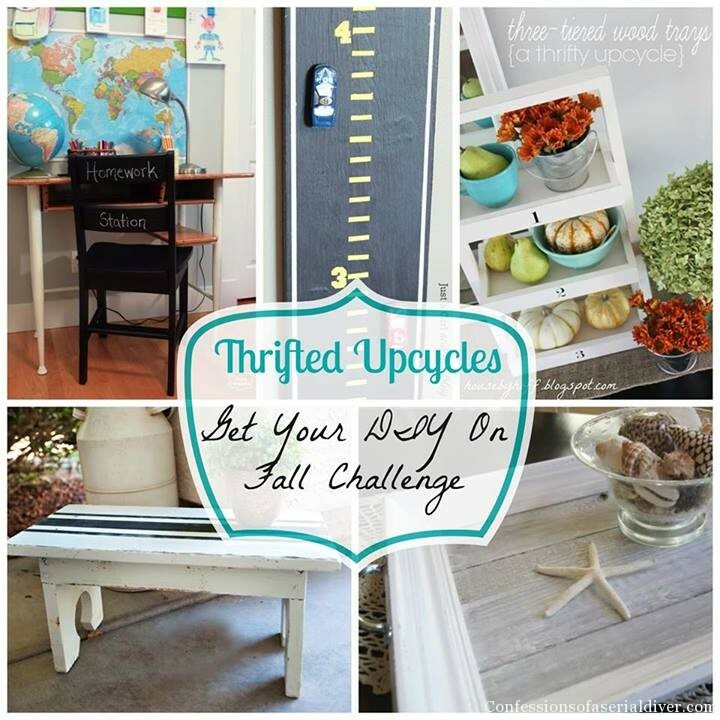 Our theme this coming week is Under $20 Thrifty Upcycles! I hope you’ll drag out your thrifty upcycle projects and come link them up this Sunday, Sept 22nd, starting at 7:00 EST! Check out the link above to see all sixteen weeks’ themes. Our current week’s theme is fall wreaths…you still have until Friday to link up your fall wreaths here and have a chance to be featured! I can’t wait to see all the creativity flowing this weekend! This is one of my favorite themes!! I have been looking for that picture of me EVERYWHERE. I love your little tray. Wanna know what I love more? You said dragged! And you are fully aware how to use it’s and its! … the little things in life that make my heart go pitter-pat…. 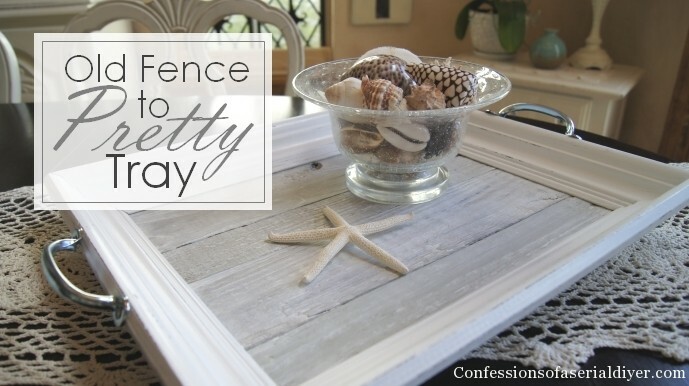 What a clever idea – from fence to table tray! 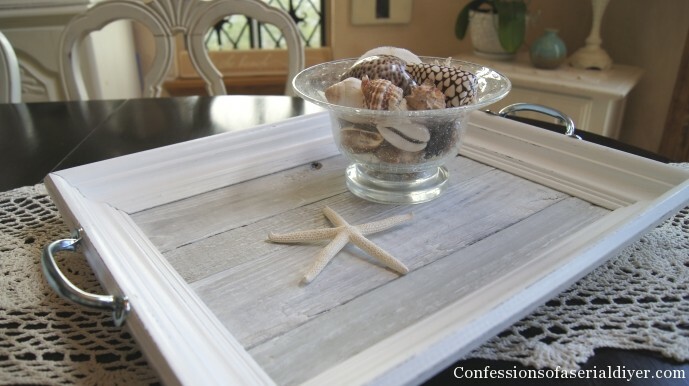 Christy, I love your upcycled tray – it is so pretty! Yes, the graphics add a nice element to the photo but the tray holds it’s own in these shots – nice job! Amazing….. It’s gorgeous….. I’m a new follower and LOVE all your projects! It does look fancy! I love how it turned out! You would never guess part of it came from the side of the road, lol! Hope you have a wonderful weekend, Christy! This is so gorgeous, and can be used throughout the whole year! I love it!! I’m always scouring the ditches for cast off wood 🙂 this is just the sort of thing I would have snatched up and dragged home also. 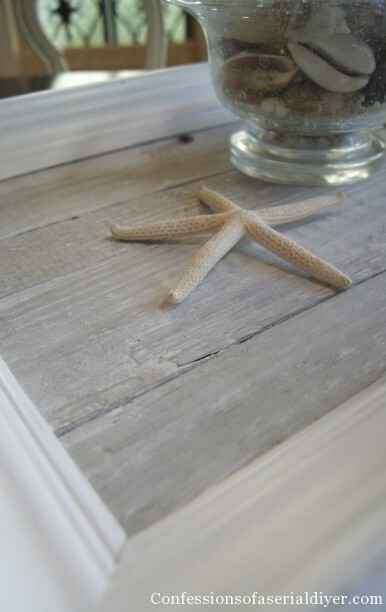 I love how you painted it but wiped it off to get the grey, beachy look. Just a wonderful, thrifty, functional makeover!! This is perfect! I love how inviting and warm it is! I LOVE the tray you made!! So simple by gorgeous!!! (found you on I Should be Mopping the Floor link party) Nice to meet you! What an awesome idea!!!!! This is a pinner! Thanks for sharing on DIY Sunday Showcase! 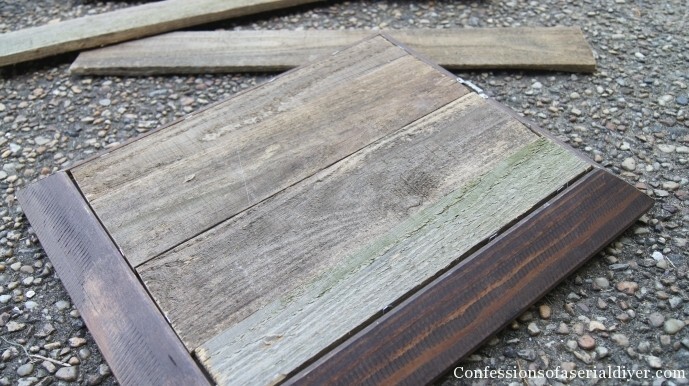 Love your rustic tray! 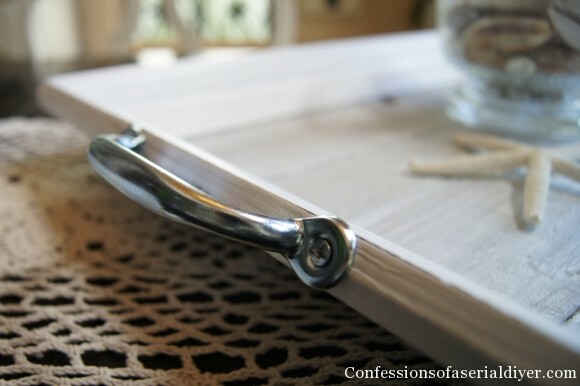 That is a great idea using old pickets for your tray bottom. Very nice work! Pinning! Thank you for sharing! Love the tray!! Come link up to centerpiece Wednesday and share this post with us. 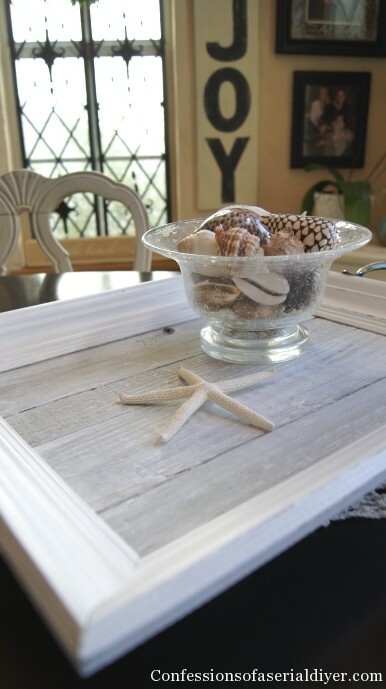 Oh I love this cute liitle rustic tray! thanks for linking to DY Sunday Showcase. What a really cool project! 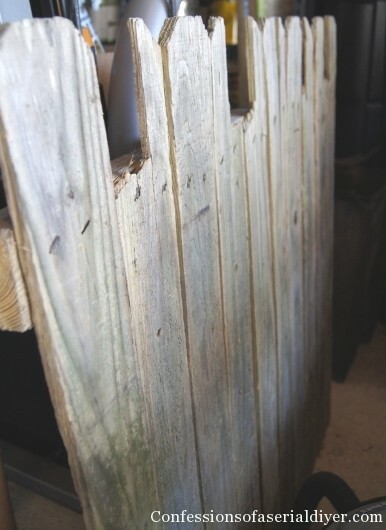 I happen to have a ton of old fenceboards from two different people who were only too happy to see me haul them away! Featuring at Redoux tomorrow at 2:00 PST. Thanks for sharing! I’m a tray fanatic and I just adore yours! I will definitely be on the lookout for an abandoned piece of fence. Thanks so much for sharing at Throwback Thursday.